In this patent, Google describes // how it plans to identify buildings, posters, signs and billboards in these images and give advertisers the ability to replace these images with more up-to-date ads. In addition, Google also seems to plan an advertising auction for unclaimed properties. In Google’s example, the software could identify the marquis and individual window posters on a theater property and replace them with new information. Through this, a theater could promote a new play in Street View, even if the actual Street View image is completely out of date. 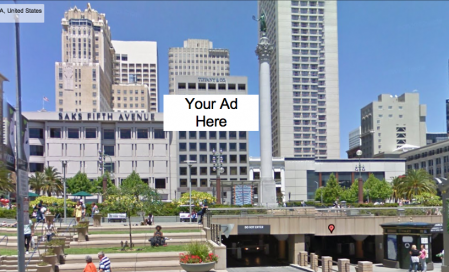 The RWW post also raises the legal question of what happens when a Clear Channel outdoor ad (e.g., for Subway) is replaced in Street View with one for McDonald’s? This is a question that hasn’t been addressed by courts. But if Google were ever to implement such a system it would likely result in a legal challenge. This entry was posted on January 12, 2010 at 4:32 pm and is filed under Legal, Local Search, Mapping. You can follow any responses to this entry through the RSS 2.0 feed. Both comments and pings are currently closed. This should be interesting to follow. I can remember the movie studios getting in trouble for doing just this with billboards in Times Square. I think it was for Spider-Man and a few others where they replaced existing and long-standing ads on certain buildings with ads for products that had paid for placement in the movie. In the in, the advertisers and the building owners noticed it right away and went nuts, suing the studios. Cant wait for this ….. “Giant ball of twine just 45 miles, exit 45” ….. “Giant ball of twine just 35miles, exit 45” ….